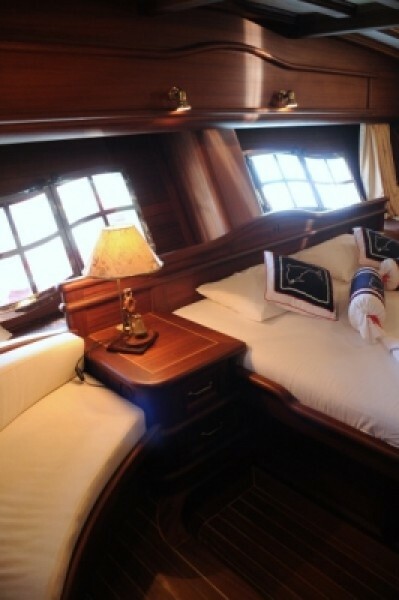 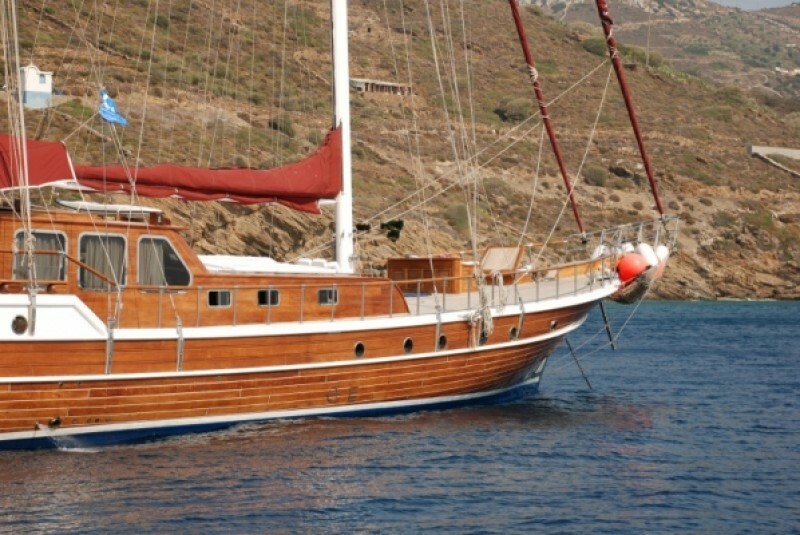 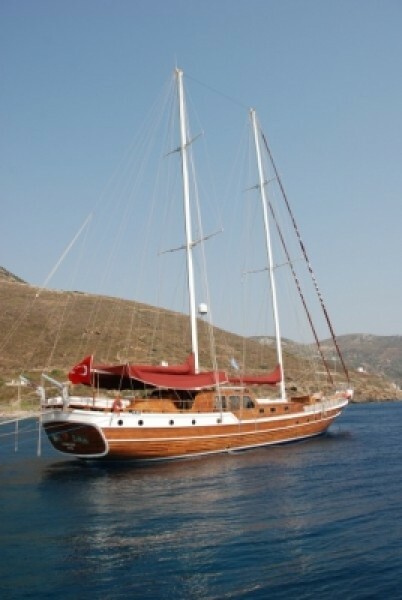 The elegant Gulet Moonlight greets Deluxe gulet charter guests with gleaming mahogany and teak finish on deck, and understated luxury in the spacious saloon and cabins, while the crew delivers polished, friendly service for the entire gulet holiday along the Turkish coast or into the nearby Greek Islands. 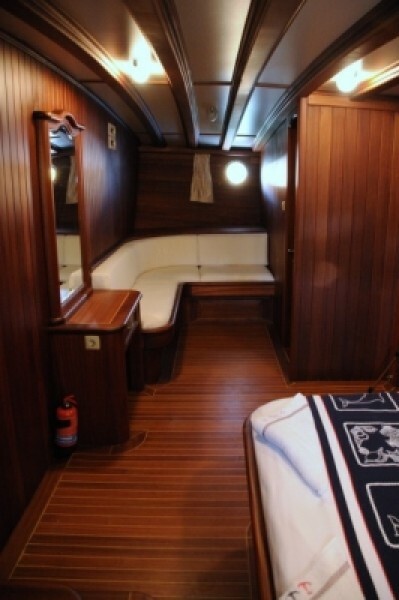 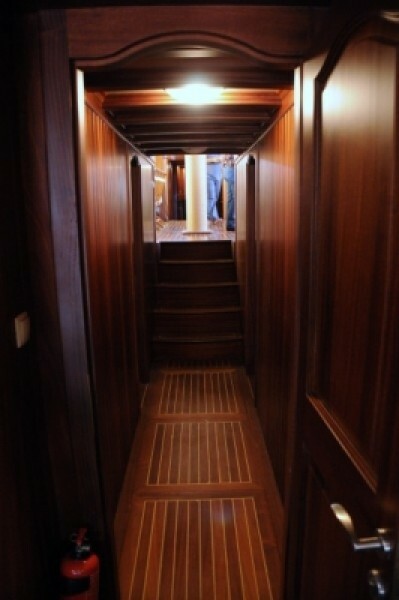 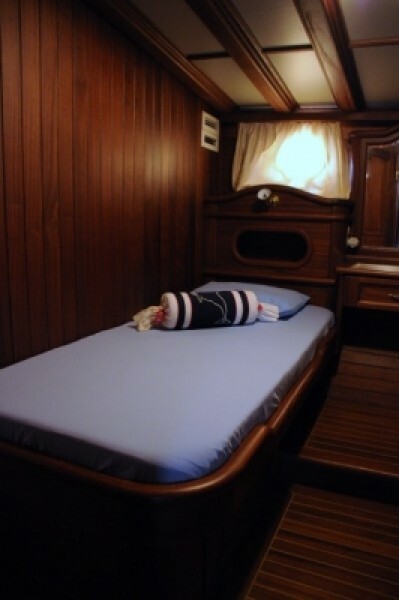 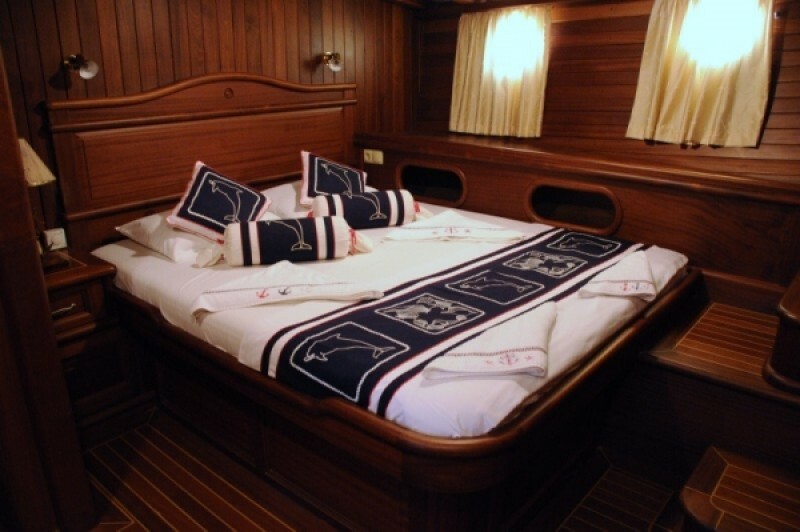 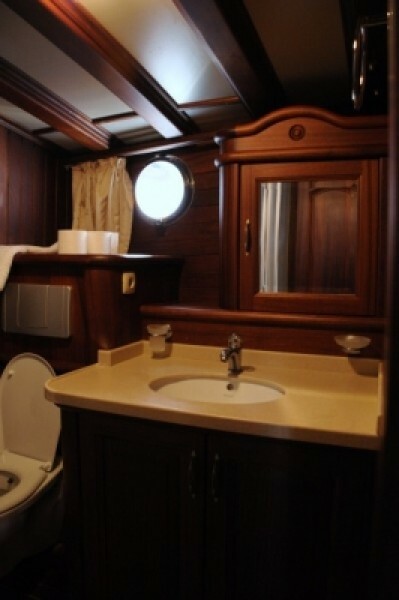 The generous space afforded by the length of the 34m hull allows roomy comfortable cabins. 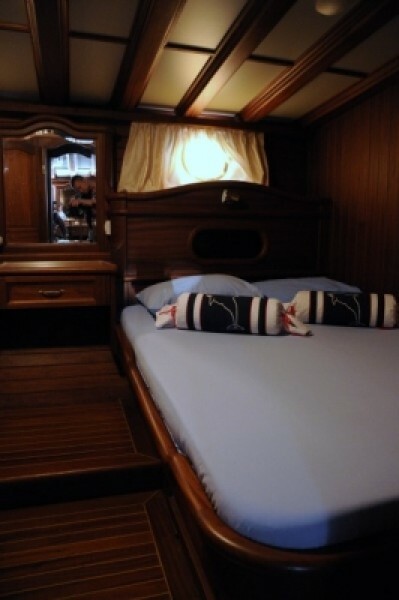 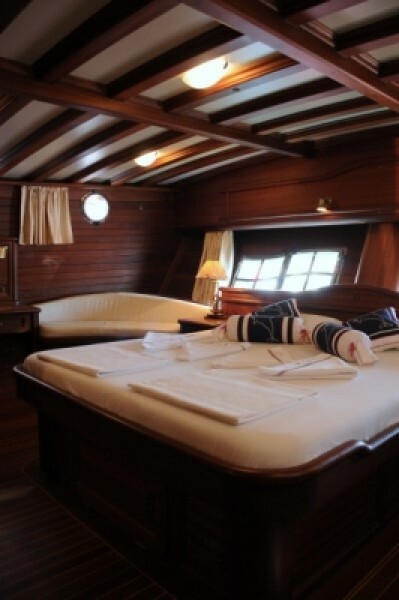 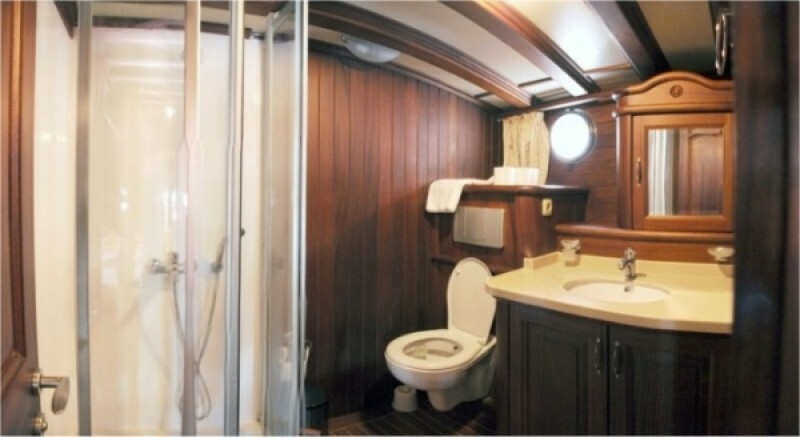 The master cabin in the aft enjoys the space across the whole beam, with sumptuous banquettes, plenty of storage and the en suite bathroom. 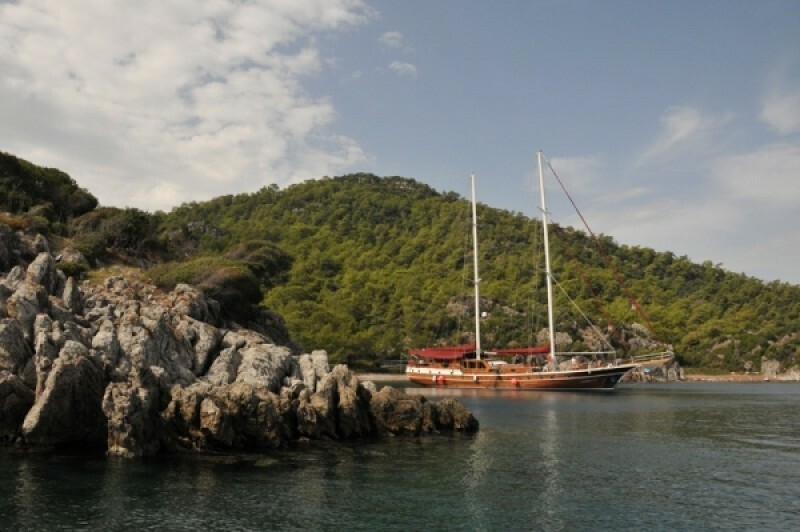 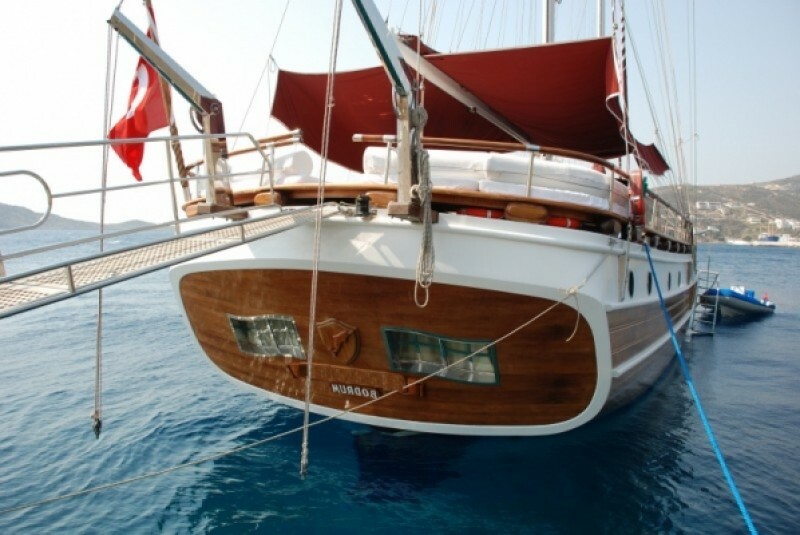 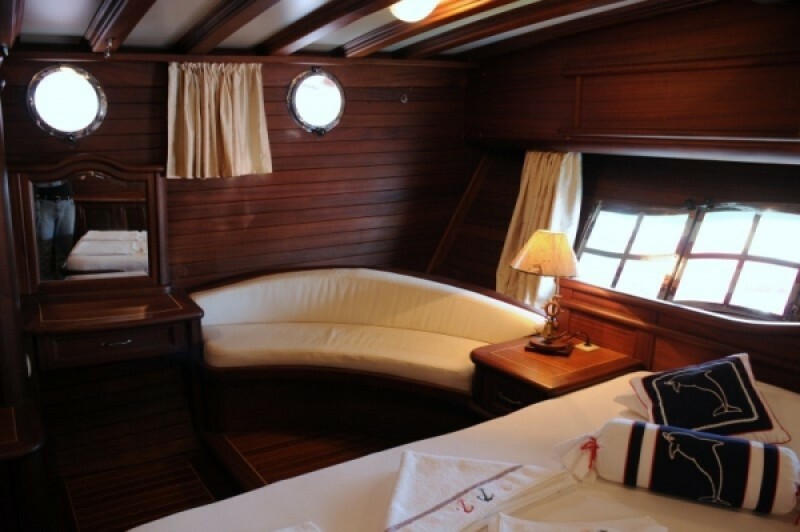 Together with a second master cabin in the bow, two double and two twin cabins, all with their own bathrooms, air-conditioning and TV, the gulet invites up to twelve guests to enjoy luxurious comfort on their holiday cruise. 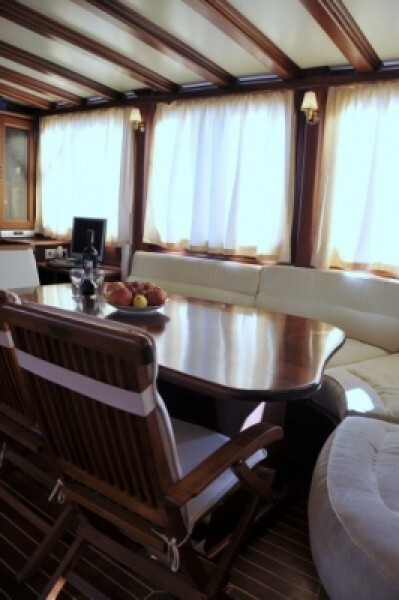 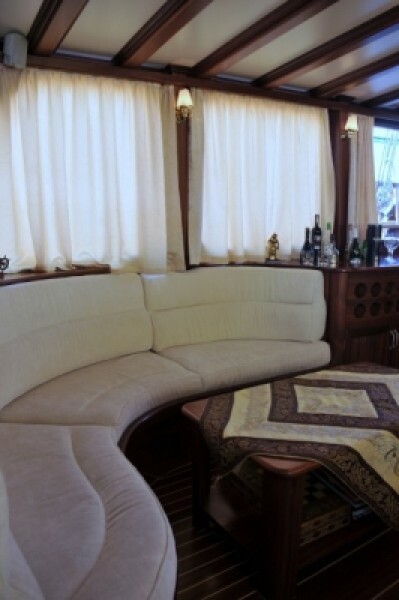 Long comfortable banquettes seat all guests at the saloon dining table or meals are more often enjoyed in the open-air at the aft dining table under the fixed awning. 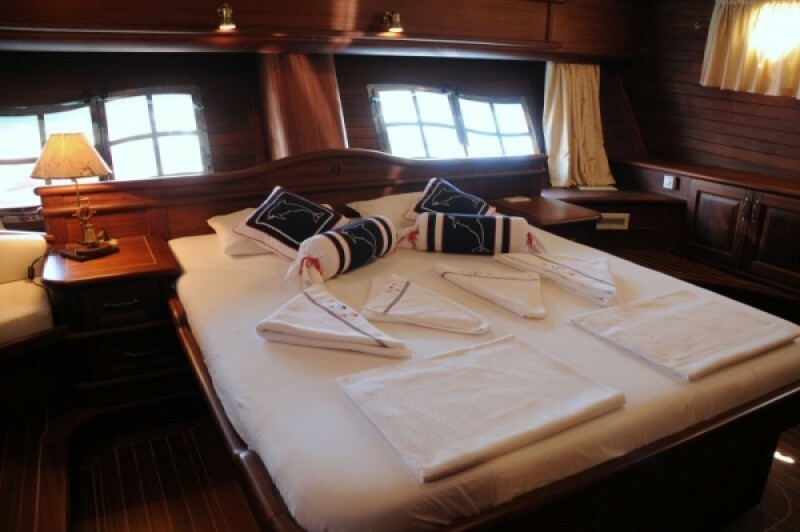 Lounging on cushions in the sun is enticingly possible on the stern cushion pad, or forward to catch the sun on personal sunbeds. 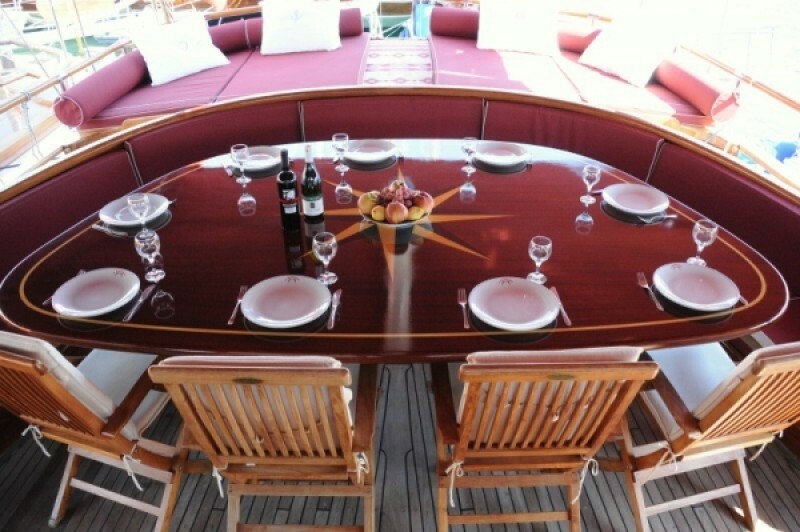 A couch seat with another dining table for meals under the stars or for sunset drinks on the foredeck completes the enjoyment of life aboard. 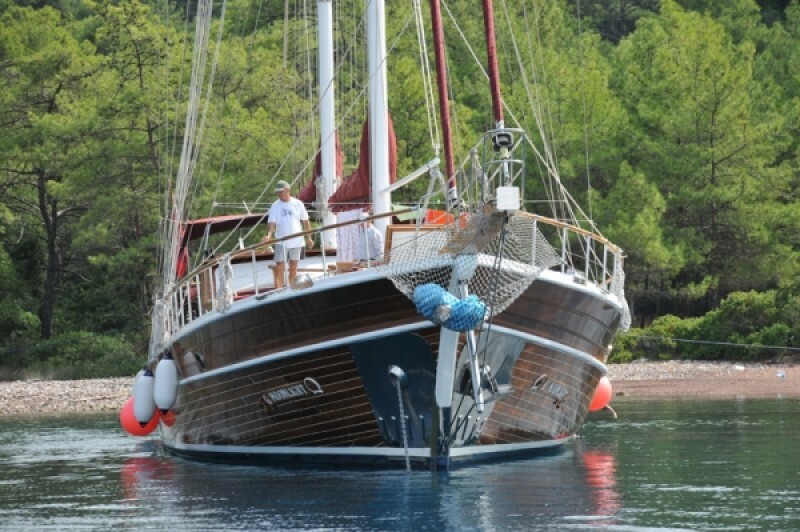 The captain and three crew on luxury yacht Moonlight, who have their own quarters, look after everything on board plus make sure that the active group of guests on this gorgeous gulet Moonlight enjoy the canoe, water ski and ringo water toys available, or others on request for use while moored in the coves of the beautiful Mediterranean coastline.